An HTML5 online photo editor offers a number of advantages over native applications. For one, they are compatible with all major browsers such as Microsoft Edge, Google Chrome, Firefox, Tor, Opera, etc. This means users can use HTML5 editors on all platforms, from Windows 10, to iOS, to Android. Furthermore, HTML5 based applications tend to load faster due to having ‘lighter’ coding. Users also do not have to waste time downloading additional plugins to get the online editor to work. If you are interested in using a HTML5 online photo editor, then you will want to take a look at the list below. All of the photo editors in this list are based on HTML5 and can only be accessed online. It is important to note that there are of course other top online photo editors found on the internet. This list is merely meant to help point users in the right direction. In addition, the photo editors in this list are not ordered from best to worst. Rather, each of these applications are unique, and will hopefully help each reader out in his/her quest for a html 5 online photo editor. 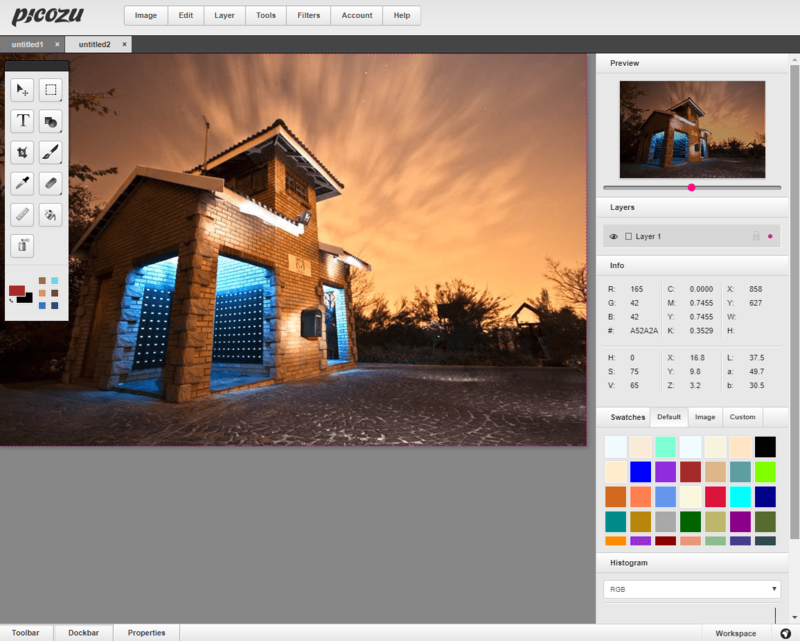 What are the best HTML5 online photo editors? Picozu is a simple and convenient editing application that users can quickly jump into. Best for beginners and users who do not need a whole lot of powerful editing tools. Perhaps the most popular HTML5 online photo editor, Picozu is an easy to use tool that is loaded with features. It is based completely on HTML5 and CSS3, making it independent from Flash. This also means that users will be able to edit all of their materials on the internet. This online editor is especially ideal for users looking for a wide range of filters. Drawing capabilities: Picozu users have the ability to draw on a document using a wide variety of brushes. Users can create entire images from scratch using this feature or simply touch up an uploaded image. Editing Tools: The photo editor offers numerous editing tools such as layers, color fill, freehand selection, cropping, and more. You also have over 120 filters that you can combine to create the perfect photo. Easy-to-Share: A very convenient feature, as it allows you to immediately share your finished work to popular media websites such as Facebook and Flickr or to cloud services such as OneDrive, Dropbox, Google Drive, etc. Import from Adobe Photoshop: With this feature users can import projects from Photoshop, while keeping the layers to edit on. Numerous format options: You have a wide variety of formats you can use to save your projects in. Adobe PS, PDF, Bitmap images, Tiff, JPEG, and PNG, are some of the formats you can save your images in. Convenient and Easy to use Interface: The UI is both aesthetically pleasing and easy to navigate. Furthermore, it is built in such a way that you can work on several projects simultaneously on the same PC. Picozu is a free to use application, with the option to pay for a subscription that allows users to access all of its features. Users choosing a longer term subscription, will get a discount. More powerful than Picozu, Photopea has often been called the online Photoshop because of its handy features. Designed more for users who have had experience editing photos, Photopea can be overwhelming for first timers. The great thing about Photopea is that it doesn’t trouble itself with a fancy, artistic user interface to entice users. Instead, it relies on its powerful tools and features to keep users coming back for more. So, if you are someone who prefers a clean application with highly effective tools to work with, then you will want to consider using Photopea. Html 5 based: Users simply have to click on the link and they will be able to use the online photo editor. It does not require users to download a plugin. Rapid response and load times: Photopea works great on all major browsers and usually does not have any lag when you are editing photos. Supports multiple formats: You can save your images in the following formats: JPG, PSD, PNG, and SVG. Inexpensive: Premium accounts are affordable, costing only $12 USD for 90 days. Premium account users can only work on improving PP and hide advertisements. Plain interface, which can be unattractive to some. Specifically built for artists, DeviatArt lets users edit as well as use a number of tools to create art. Users looking for more drawing tools than editing tools will certainly enjoy this application more. Users looking for an outlet for their creativity, should check out this html 5 photo editor. While DeviantArt muro is simple, it has a pleasant interface and offers some neat layering options. 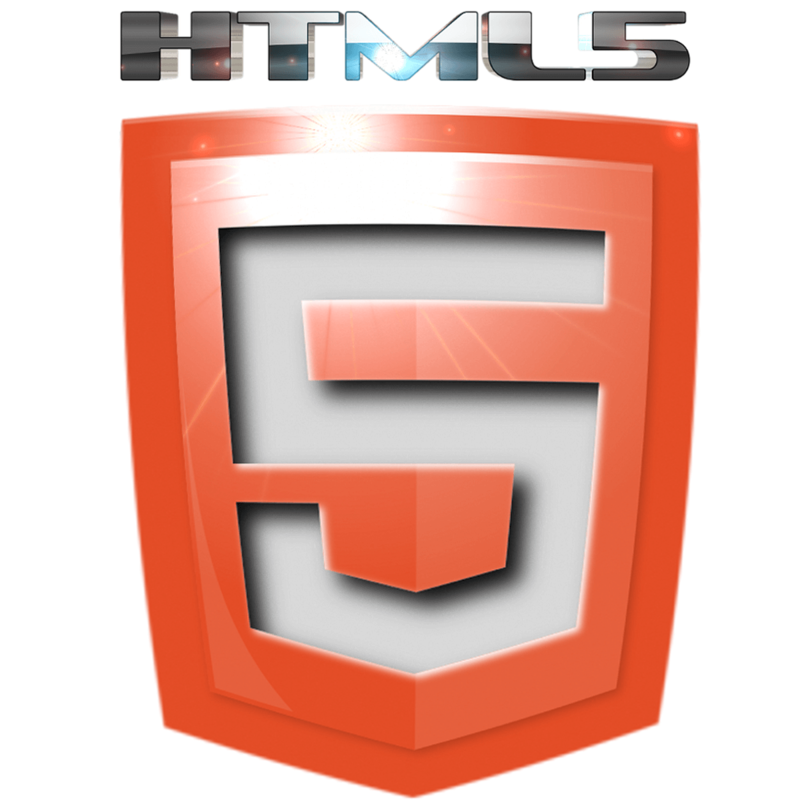 Html 5 Application: This application runs entirely on Html 5. So you can also quickly access the editor by a simple click of its link. No additional plugins are required to be installed. Caters to artists: Projects are automatically saved if you sign in to a DeviantArt account. Highly effective drawing tools: There are several drawing tools that users can use to create their next masterpiece. DeviantArt muro is a niche application that caters to individuals who want an editor that has drawing features. If you are looking for a powerful editor that offers professional level editing tools, then Fotor is the HTML5 online photo editor for you. Praised by both professionals and hobbyists alike, Fotor is the editing tool for everyone. It boosts advanced HTML5 technology and some of the best photo editing tools on the market. With Fotor you also have the option to create photo collages and graphic designs, in addition to editing photos. Cloud Services: Creating an account on Fotor automatically gives you access to its cloud service. This allows users to easily save their unfinished work online on to a cloud. Users will then be able to access their unfinished work from any other device as long as it has internet access. Html5 Technology: Since Fotor is an online photo editor powered by Html 5, you should expect fast and stable services. HD PDF: This means you can create flyers, invitations, cards, etc, that can be printed at very high quality levels. Packed with editing tools: The Premium version of Fotor offers the most in terms of features and editing tools, when compared to other applications on this list. Fotor users can have editing tools that allows them to manipulate fonts, image shape, icons, clip arts, stickers, shadow, color, and much more. Countless Templates: The photo editing application offers users thousands of preset templates that are not only stunningly beautiful, but also professional. With these templates users can easily create posters, cards, social media covers, blog designs, advertisements, etc. Beatify: A unique element found in this editor is the beauty retouching feature. This tool allows users to touch up their selfies to fix blemishes and to beautify. HDR: Allows you to completely enhance an otherwise drag looking photo. Tutorials: If you ever feel overwhelmed by the numerous features, you can always access the easy-to-follow tutorials located on their website. Not designed for artists who want to start from scratch. May seem overwhelming for users who want a quick editor. basic, unpaid version does not offer much. Users who want full access to all of the features of Fotor must purchase a monthly subscription. Users who buy a yearly subscription will get a discount. 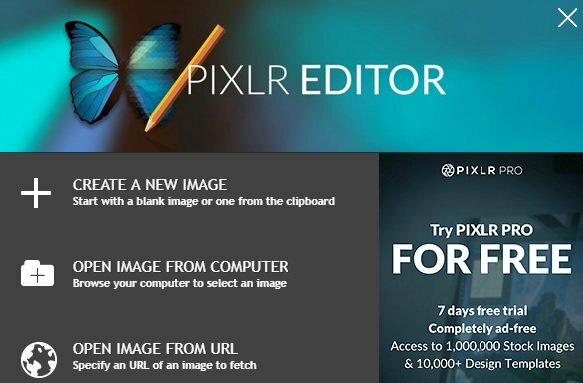 Pixlr Editor is an excellent HTML5 online photo editor that’s very easy to use. The user interface is very intuitive. If you’ve used Microsoft Paint before, you’ll quickly get the hang of Pixlr Editor. The platforms offers a series of advanced photo editing options that allow you to create impressive images or improve the quality of the pictures you upload. There is also a premium version of the tool available that allows you to unlock many useful design templates, stock images and editing features. An HTML5 online photo editor offers many advantages over traditional editing applications. Faster, easier, and more flexible, HTML5 applications are a highly effective solution to your editing problems. With this lists, individuals will find it easier to find the online photo editor that meets his/her unique needs.